LENGTH X WIDTH X HEIGHT: 196.8 x 76.0 x 71.6 in. 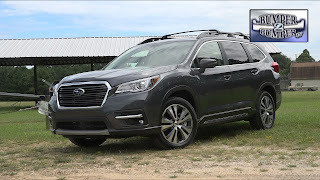 BOTTOM LINE: Subaru’s venture into full-size SUVs with the Ascent seems to be a good idea, with very good cargo capacity combined with good performance. 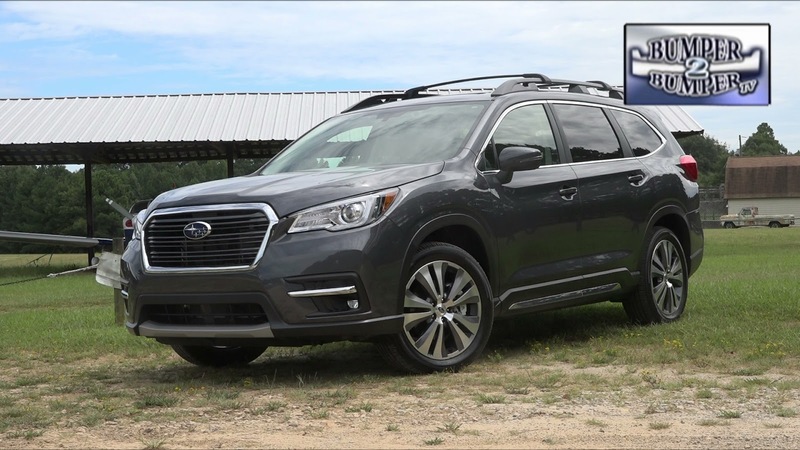 The Subaru Ascent is Subaru’s largest vehicle ever and puts the brand squarely in the middle of the highly competitive full-size SUV market. While to some it may make the Forester and Outback look like Tinkertoys, the Ascent has three rows of seating and, if preferred, a lot of cargo capacity. More importantly, the Ascent provides a comfortable ride with adequate power. In addition, good handling completes the positive side of the equation. Another advantage is the heating system. We drove the Ascent in cold weather (it is winter in the Northeast remember), and we were completely comfortable with a great HVAC system and heated seats and wheel. I almost didn’t want to leave the Ascent. Front passengers face an interesting dash. There’s a fairly normal instrument panel, but two screens dominate the center. The main screen is for infotainment, and that’s fairly normal. On top of the dash is an economy gauge screen that tells you everything you’d want to know and more about the fuel, plus the outside temperature and a digital clock. Oddly, there’s a heads-up display (HUD) for the driver but it only warns about lane departure, nothing else. The dash includes many controls for functions that requires a study of the owner’s manual to figure them all out. For convenience there’s a shelf in the middle of the dash. On the driver’s side it’s good for a phone or keys. The shelf is longer on the passenger side. Additional storage includes a small cubby at the base of the center stack with two USB outlets and an AUX outlet. X-mode and AVH switches are there also. There’s a nice deep center console/arm rest for larger storage. The steering wheel is busy with manual shifter paddles behind. Subaru has installed an all-new version of its legendary horizontally opposed four cylinder engine that is 2.4-liters in capacity and delivers a healthy 260 horsepower, enough to tow 5,000 pounds if you so choose. While the third row seating offers the usual tight legroom, the second row has good legroom. Second row seats are heated, and the captain’s chairs have arm rests for comfort. Additionally, the Harmon Kardon sound system offers good sound quality in the second row. There’s also a large sunroof that extends back to the second row. Cargo capacity, which is what an SUV is all about, is excellent. I would love to have challenged it with larger items, but we didn’t have the opportunity. Safety is aided by blind spot monitoring and lane departure warning, as well as a “spy mirror” instead of a sunglass holder so you can check on the antics of the children in the third row. Ascent’s most important feature is the total of 19 cup and bottle holders scattered around the cabin. Subaru’s Ascent is a welcome addition to the full-size SUV segment. It offers performance and capability is an attractive package. The Boxer 4-cylinder engine lowers the center of gravity to make it a formidable challenge to those SUVs with taller 6-cylinder engines. 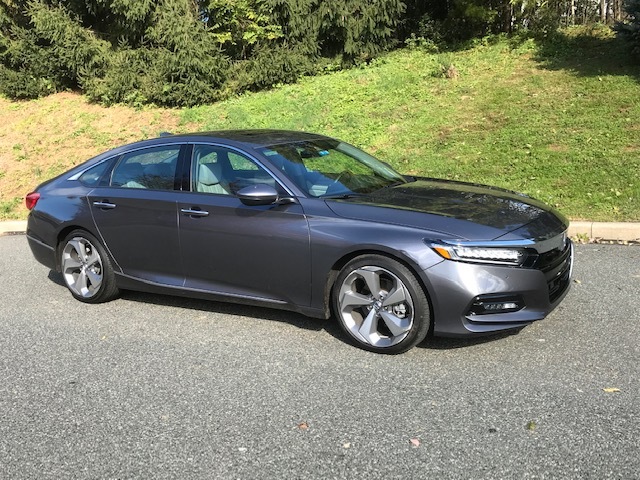 The shifter is unique to Honda vehicles, and we have used it in Acura's as well. There is a Park push button, a Reverse pull lever, neutral and drive push buttons. All light with different colors so you have a tactile feel for the different gears as well as a color sense.